I had a sneaking suspicion that I would spend every last dime that I made at The Renegade Craft Fair and I was almost right. Although I showed restraint, I didn’t walk away empty handed. Feast your eyes inside my shopping basket! 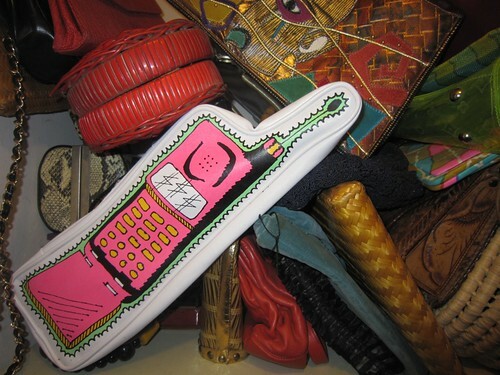 Not to pick favorites, but I am pretty damn smitten on the extra large and extra neon vinyl 80’s cell phone pouch purse thing I got from Burger and Friends. My friend Karly got one first, showed me hers and within minutes we were fake calling each other on our pouches. I finally got my Figs and Ginger mama and baby deer necklace. After planting a loquat tree last year to procure a free pair of fawn earrings, I clearly needed the matching necklace. They can add more fawns if I get knocked up again. I’m tickled fuchsia with my new Vahalla Studios prints. This crew was my neighbor during the event and it took a lot of will power to only walk away with two prints. My other neighbor (I was on a corner) was Rubina, a nice as pie gal from Brooklyn with a-doorbell cards. We did a trade. 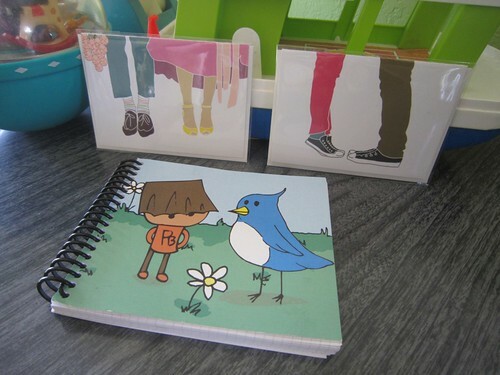 I also did a trade with Robo Roku for one of their awesome little notebooks. 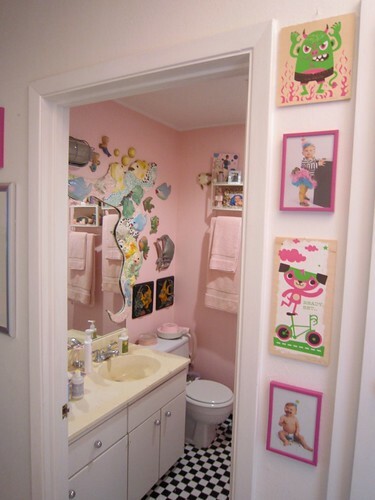 As if Tallulah does not have enough clothing…. I could not pass up this little Texas themed Tee from Blue Bird Vintage. 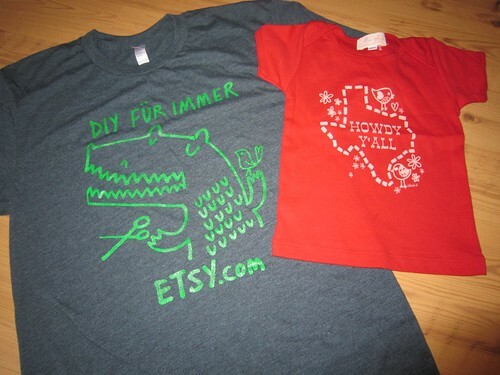 It was totes fun chatting with the lovely ladies of Etsy in their booth, had to get a T-shirt to commemorate the event. Sadly the maker of this fun hand painted seahorse did not put a label in their headband or a card in my bag so I can’t say who made this cutie. All I know is that I like it! I also traded Sweet Tooth Bags for two fabric covered barrettes (only one seen here, Tallulah has already lost the other). I got an super duper fun surprise at the show. Michelle of Knotty Bags popped by to bring me one of her amazing crocheted bags. 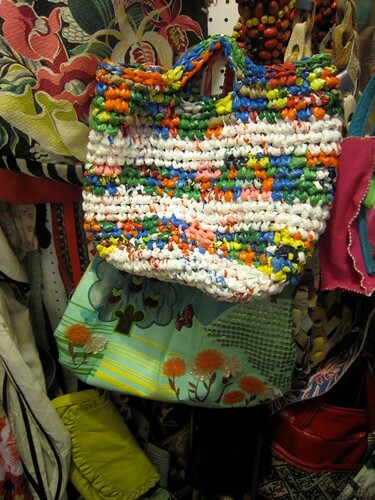 Not just any bag, one made from plastic bags! I have been dreaming about one of her purses and this one is extra colorful and extra awesome. 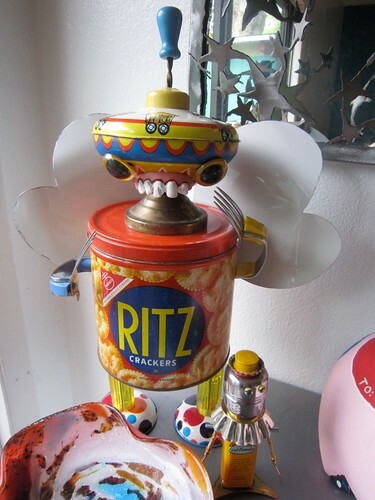 My favorite thing I got at the entire fair was one of my mother Fredda Perkins robots named Ritzy. She promised me if he didn’t sell he would be mine. I have to say I didn’t actually encourage people when they were eyeballing him since I wanted to keep him all for myself! I’m already thinking about the goodies I didn’t get and checking out the vendors stores online! 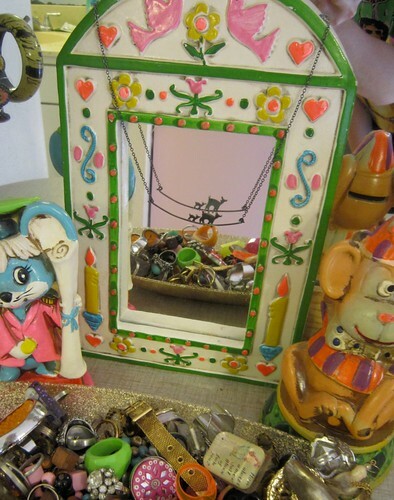 Posted May 19, 2010 & filed under Austin, etsy, Jewelry. yay for renegade goodies! it was a blast. (p.s. 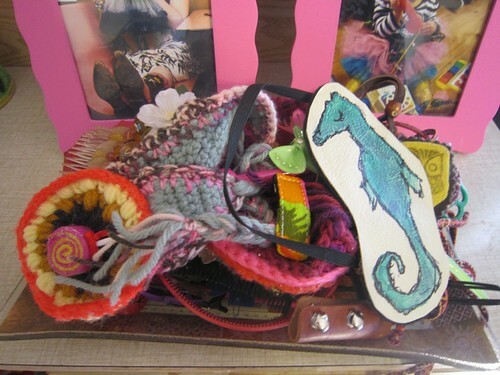 i think your seahorse headband is by the charming meganlee designs). My favorite purchase, was the jar of goodies from you. I'm dying to get home today and into my craft room with some glue! It was awesome meeting you! Oh you lucky dame, the robot is adorable. oh yay!!! i am honored to make it onto the NSC blog 🙂 It was SOOO good to meet you and i've been wearing your rings like crazy! abe lincoln is a fave among the brooklynites! Will get back atcha asap! Fun stuff! I'm so glad to finally see some pictures rolling in from Renegade – I wanted so badly to be able to make the drive to Austin to check it out, but it just didn't come together. Maybe next time. Looks like it was a blast! oh I love that fawn necklace – so perfect for you + Tallulah!!! Thanks Laura, I hope you make lots of fun things with the jar! Ola the robot was a major score. Tallulah laughs at him daily as she sits in her highchair and looks at him. Rubina it was so nice to meet you and your delightful parents. oh good, i'm glad i found the headband source – megan does adorable work. the antique mall that's home to the crazy kangaroos on my blog is austin antique mall, 8822 mccann. ma-gi-cal. thanks for sharing your amazing city with us; we can't wait to come back!